Gary Houston on Oprah's Next Chapter: "I loved Bobby Brown, he was a good guy"
Whitney Houston’s family speaks out about the late singer’s incredible spirit in an emotional interview with Oprah Winfrey on Sunday’s Oprah’s Next Chapter. 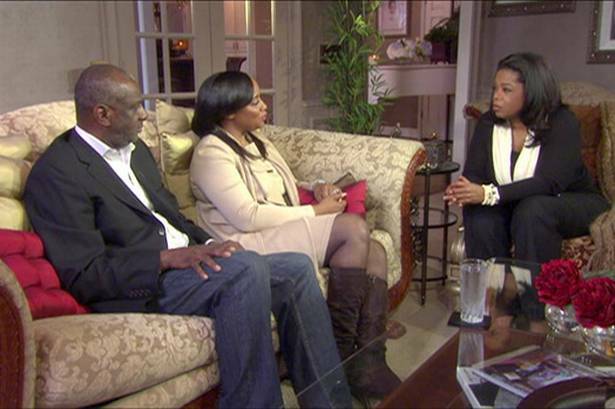 In a March 11 special shot in Atlanta, Oprah Winfrey interviewed those closest to the singer: her daughter Bobbi Kristina Brown, longtime manager and sister-in-law Patricia Houston and brother Gary Houston. Bobbi Kristina Brown, 19, spoke first, saying that she still feels her mother’s spirit around her. “I can sing her music but to hear it right now – I can’t,” Bobbi Kristina said. Furthermore, Bobbi Kristina says although it is hard to keep herself together after Whitney Houston’s death, she’s managing to do it day by day. “I start crying and deal with it, but then I hear her voice again: <<Keep moving>>,” Bobbi Kristina said. Patricia Houston spoke next, saying that she thought drugs might eventually play a role in her death. “The handwriting was on the wall,” Patricia Houston said. Furthermore, she said Whitney Houston was really focused on starting the foundation of a career for Bobbi Kristina. “She loved Krissy with everything she had, and was trying to make things right with her,” Patricia Houston said. Gary Houston, Whitney Houston’s brother, also spoke, saying he was shocked to hear that his sister’s life was taken so soon. “I never thought anything like this would happen,” Gary Houston said. Gary Houston also spoke on behalf of his mother Cissy Houston, who declined to participate in the interview. “I think she’s doing better now,” Gary Houston said. The 90-minute television special also touched on Bobbi Kristina’s father, Bobby Brown, who had a tumultuous marriage with Whitney Houston. While some have accused Bobby Brown of introducing Whitney Houston to drugs, Pat Houston, and Whitney’s brother Gary said that was untrue, and had warm words for Bobby. “I loved Bobby Brown. Bobby was a good guy,” said Gary Houston. Patricia and Gary Houston said Bobbi Kristina has a relationship with her dad, but that the two have not spoken since the funeral. Meatloaf: "Whitney Houston was one of the three best voices in the world"